I liked this book, too, but for different reasons. My son wants to join the Army. I couldn’t help but get emotional. If you’ve read the book, you know why. I don’t know if many of my students will relate to Alice Bliss. I don’t know if they have the kind of relationships with their dads that Alice has with hers, but I know they probably want one. And it’s not too late it their lives to try and make it happen. You know, my dad used to garden–a big deal in the hot Texas sun, but I rarely spent time with him out digging around in his grow boxes. I was impatient, and he didn’t say much. He also worked on cars in our garage and built fly rods in his workshop. I had no interest, and he didn’t push. Now, I wonder at the missed opportunities, and I’m sad that it’s too late. I will share this sweet book with my students and remind them that it is not too late for them. For an idea of the beauty in this book, check out this beautiful collection of images on Laura Harrington’s Pinterest board. Showing students the images might be enough to spark some interest, along with a passage or two that shows Alice’s voice. Oh, and this Pinterest board idea– imagine if students create one for their favorite book? That might be a nice way for them to show me they understand imagery, allusion, symbolism. Hmm. Now, I got myself thinking. What do you think? 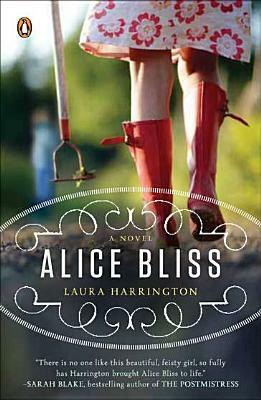 I love Alice Bliss and think it’s perfect for American Lit classes. I hope more high schools will include it in their curriculum. It’s a classic for our generation! Hello – what a pleasure to find your blog and your comments about Alice Bliss. Connecting to teachers and students is a passion of mine and nothing means more to me than the possibility of Alice Bliss in the classroom. We have just developed a teacher’s guide which I’ll be taking with me to the AASL and NECTE meetings in November. Would you like me to send it to you? Sure, that’d be awesome, Laura. I would love to see your teacher’s guide, and I will most definitely need to share it with my teacher friend who referred your book to me. Thanks!